Don’t you wish we could keep kids like this? *Please note he climbed in there himself. The cage was not locked and he was fully capable of getting out on his own. He was only in the cage for about five minutes. That does look like a good place to keep the kids – lol. Looks like he was having fun and curious about trying out the cage. 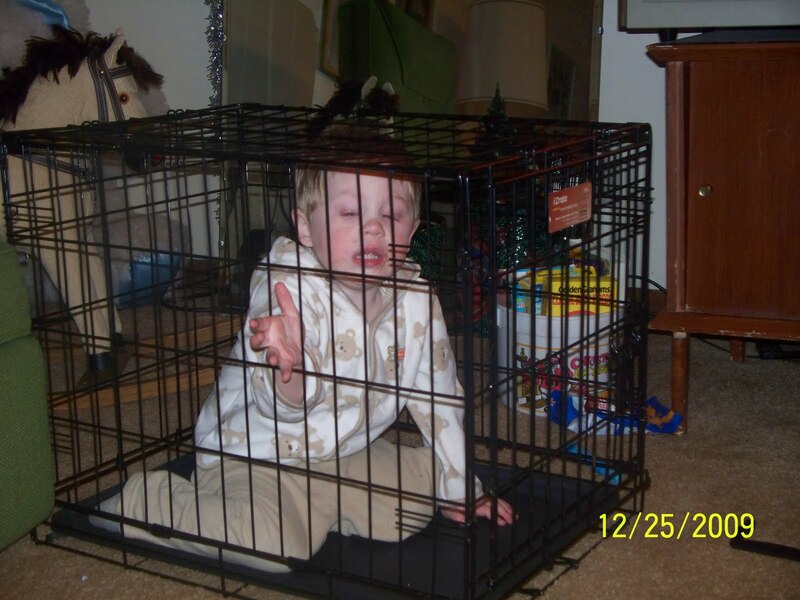 My kids love climbing into the dog cages too…and I've wished that I could keep them there at times too! LOL! lol, isn't it funny how in this day and age we have to put disclaimers up for something so innocent? Does any pet really live in there because the cage is so clean?!! I don't think any child could resist climbing in there! Too funny! It amazes me what kids get in to sometimes! Yeah why are dog cages so interesting to kids.. lol Lil Kiwi loves to go visit the dogs. lol i love the disclaimer. you never know what comments you can get these days though!! Hee hee! My youngest sometimes crawls in our dog kennel too. That is funny. My son used to sit in the dog's bed and pretend he was a puppy. I drew the line with letting him play with the dog toys though! Ha! That is so funny. Kids are so curious. I'm glad you explained the picture though. LOL. My kids used to crawl into ours all the time too!! Part of their “i am a doggy” playtime! Have a great weekend! It wouldnt work to my benefit. They would love it and play in there all day. Thanks for stopping by. Haha! Logan likes dog cages, too! Thank you for the comment on my post about the Dr Sears book, yeah I just can't get enough of their books!